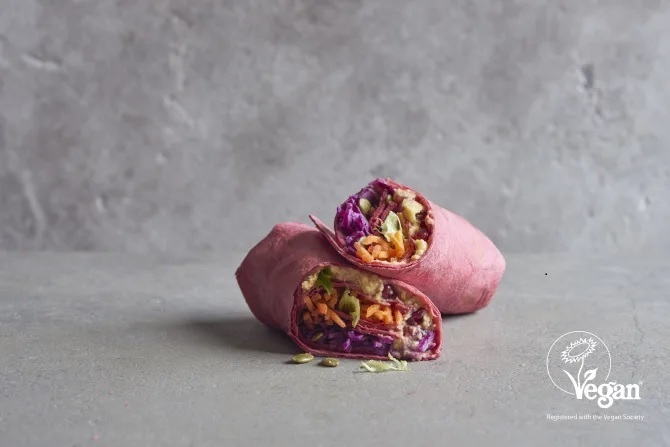 LONDON, UK, 2019-Feb-12 — /Travel PR News/ — Virgin Trains has launched a new wrap approved by the Vegan Society after forming a partnership with the charity to provide more plant-based food. The Hummus and pomegranate wrap has gone on sale in Virgin’s onboard shops following a rigorous registration process by the Vegan Society to ensure all its ingredients are free from animal products. The partnership was formed after Virgin Trains became the first train operator to offer vegan-friendly options on all its menus last December. The latest addition to its menu comes as Virgin Trains responded to customers who said they wanted to extend “Veganuary” to the rest of 2019 or simply cut down on their meat and dairy intake. Julie Harper, Virgin Trains’ Food & Beverage Proposition Manager, said she had been overwhelmed by the response to becoming fully vegan-friendly in December. Virgin Trains’ partnership with the Vegan Society, the oldest vegan charity in the world, was launched to underscore its commitment to incorporating tasty vegan options into all its menus. The Hummus and pomegranate wrap was certified with help from Virgin’s sandwich supplier, Street Eats, and is available for £3.90 from its onboard shop. This entry was posted in Business, Food & Drinks, Trains, Travel, Travel Management, Travel Services, Travelers and tagged Elena Orde, Julie Harper, partners, plant-based, Vegan Society, Virgin Trains, ‘Food. Bookmark the permalink.